Dress Shirts are a great option for Company Logo Shirts. Dress Shirts can be worn with a tie or without; at work and after work. We have styles catered to Executive wear and modern Dress Casual wear all which can be customized with your company logo. Available options includ long and short sleeve; denim, twill and silk; standard fit and slim fit; and more. Your company’s logo embroidered on these handsome shirts will build recognition, pride, and loyalty for your company or organization. Woven Shirts with your Logo embroidered will give your company the professional look you want. 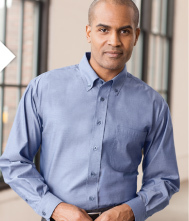 We offer many options such as oxford, twill, poplin, and many different styles and colors. We have company dress shirts with button-down collars and without. We also have other options such as stain and wrinkle resistants. We know we can find the right Company Dress Shirts for you that will have your custom logo and impress your team and clients.